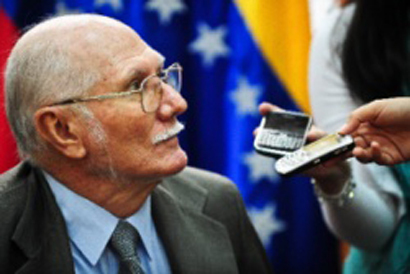 Nelson Bocaranda reports in today El Universal that the nomme de plume Simón Andrés Zuñiga, frequently present in aporrea pontificating about economic matters corresponds to none other than Minister of Planning and former Minister of all things financial Jorge Giordani, citing as the source former Minister of Planning Felipe Perez. I had read Zuñiga frequently, but if true his writings gain an added value because Zuñiga claims to be an economist. But Zuñiga frequently shows weak points on economic matters, citing isolated cases, like Argentina’s Caja de Conversión but ignoring other experiences on the matter. (Hong Kong anyone? Or Venezuela pre-1970?). In fact, he cites Ecuador as another example, suggesting that Correa can not remove the dollarization he inherited because of its political cost. In fact, Zuñiga’s arguments are dense on ideology and short on content. Because it takes a very ideological point of view to suggest dollarization, or any sort of foreign exchange flexibility, would “bad” for the workers, given that Chavista policies have generated 1000%-plus inflation over the last 14 years, truly hurting the working class, which managed periods of prosperity only when the Government had the foreign currency to keep the parallel rate down and whose purchasing power is currently decimated. While the articles show an understanding of how the parallel market and why you need funds to lower it (At least better than Minister of Oil and Energy has), it seems to blame everything on conspiracies, as well as a deep belief that exchange controls have to be in place, despite the fact that economic history shows their recurrent failure. The main conspiracy: That players want to benefit form the bounty that Cadivi represents, but Zuñiga, whether Giordani or not, fails to note that it has been those near the revolution that have benefitted the most from it. And that cyanide candy is not mentioned in the article. This entry was posted on	octubre 29, 2013 a 11:42 pm	and is filed under Sin categoría.